Pace teams/pace groups: What, When, Where, Why and How? First, not all pace teams are of the same high quality as ours. If you ask a number of runners you will undoubtedly hear someone recount a story of a less than ideal pace group experience. So please do not infer that all pace teams and pacers are of the same high quality as ours. With that said, the vast majority of pacers around the world are highly conditioned, experienced, passionate, caring athletes who are willing and anxious to give back to the sport by helping fellow athletes during their race. Our pace team’s ultimate goal is to finish very close to the assigned finish times, often within seconds of the time on the pennant they will be carrying throughout the race. They are all experienced endurance athletes who have demonstrated an ability to finish their assigned race distance considerably faster than the group time they will be leading on April 27. Many of them will travel from all over NJ and from other states, run a much slower race then they are capable of, pay their own expenses and volunteer their: time, experience and knowledge to help make your race experience as memorable and satisfying as possible. They are truly exceptional people in their accomplishments and in perhaps most importantly their caring for fellow athletes, and we are very proud that each one has chosen to be an important member of our 2014 Pace Team! Does each pace group approach race tactics exactly the same? You should be aware of the differences in accomplishing the goal finish time for each pace group. Some will: create a steady pace throughout the race; run a bit slower in the early miles and race slightly faster per mile during the second half of their race. Some will walk through fluid stations, others will not, some will use a run/walk strategy throughout the entire race, other will run the entire distance. While those are different race tactics, they will all accomplish the assigned finish time goal. That may seem impossible, but each are tried and true tactics which have worked for the pacer(s) previously. If a particular race tactic doesn’t suit your race plan, it is important to find that out prior to joining a particular pace group on race day, and it is your responsibility to do so. Each pace group leader will be glad to discuss their race tactics with you. What else do pacers do besides ensuring a specific finish time? What could go wrong in racing 13.1 or 26.2 miles? The answer is, lots!!! These experienced, caring athletes can help you to anticipate trouble spots and provide help in dealing with them, amuse you with jokes and stories to keep you relaxed, provide knowledge about some of the municipalities and points of interest along the course, and generally act as cheerleaders for each person in the group. What will they not do? They will not: alter their goal finish time if you can’t keep up, they will not wait for you if you decide to take a bathroom break, and they will not alter their race strategy if it conflicts with yours. Q1. How do I sign up to run with the pace group? And how much does it cost? A1: It is FREE to run with our pace team. Just meet our pacers at the start on race day. We also recommend you to visit our Pace Team Booth at the Expo on Saturday. Our pacers will be available at the Expo to meet you and to answer your questions. Although you are not required, we recommend you to sign up at the Expo so our pacers will know how many runners to expect. Q2. Am I obligated to stay with my pace group for the entire race? Can I join a pace group in the middle of the race? A2: No, you are not obligated to stay with our pace group for the entire race, and you we welcome to join our pace group at any point during the race. Remember, it is your race! Q3. Where do I find my pacer on race day? A3: Our pacers will lineup at the start 30 minutes prior to the race. They will wear the official “PACE TEAM” singlet and carry a sign that indicates their target finish time. Q4. What do I do if my pacer is in a different corral? A4: Our pacers will lineup at the corral that is corresponding to their target finish time. You may move back if your pacer is in a corral behind you. However, if your pacer is in a corral ahead of you, you may either start in your assigned corral and slowly catchup to your pacer during the race, or you may visit the Information Booth at the Expo to have your corral re-assigned. Q5. What do I do if I can’t decide what to pick between two pace groups? A5: We recommend runners to pick a slower pace group. It is always better to start slow and conserve, so you will have a strong finish rather than starting out too fast and dead march to the finish. Q6. The Novo Nordisk New Jersey Marathon course is flat and fast. Should I set a faster goal and start with a faster pace group? I can always fall back to a slower group if I can’t keep up, right? A6: No, that defeated the purpose of running with a pace group at an even split. If you start out too fast, you will most likely hit the wall and finish at a much slower time than your original goal. Again, it is always better to conserve and have a strong finish than starting out too fast and dead march to the finish. You should feel comfortable with your pace for the first two thirds of the race. Remember, in a marathon, the last 10K is where the race really begins. Similarly, the last 5K is where the race really begins at a half marathon. Q7. What do I do if there is no pace group for my target time? A7: We have an extensive lineup in our pace team that covers every Boston Marathon qualifying times. However, if we don’t have a pace group with your target time, we recommend you to start with a slower pace group and slowly work your way up. It is always better to conserve and finish strong. Q8. According to my GPS watch, my pacer is running faster / slower than our target pace. Why? A8: First of all, GPS watch is not 100% accurate. Second of all, it is very unlikely that the pace group is running at a perfect tangent of the course. Third of all, pacers usually slow down at water stops to allow runners to stay hydrated. So, it is necessary for pacers to adjust their pace accordingly. Q9. Why do you have two pacers in each pace group? Which pacer should I follow? 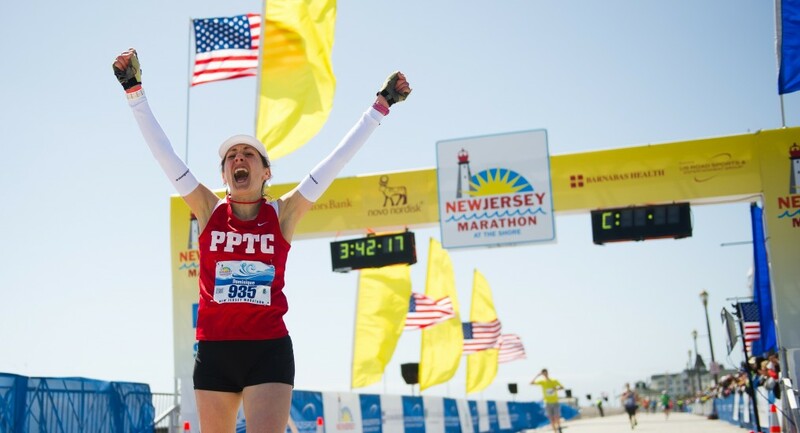 A9: The Novo Nordisk New Jersey Marathon is proud to be one of very few marathons to offer an extensive pace team that covers all the Boston Marathon Qualifying Times with two pace leaders in each group. With two pacers in each group, we can ensure that our pacers are available for you and to keep you motivated! It will also help thinning out the pace group so your race will be less crowded and more enjoyable. All our pacers are aiming to finish within one minute under their assigned goal time. You can follow either one of the two pacers in your group to finish under your goal time. Q10. I don’t like to run in a pace group because it is always too crowded. A10: Unlike most of the pace teams in other marathons, we have two pacers in most if not all of our pace groups. This will help thinning out the pace group so it is less crowded but with enough runners around to keep you motivated. Q11. What should I do if I have questions that I would like to ask my pacers? A11: We recommend runners to get to know their pacers by reading their bio on the Novo Nordisk New Jersey Marathon web site. You can also send an email to your pacers with any specific questions. Some of the pacers will also be available at the Pace Team Booth at the Expo on 4/26, and some of them will also attend the pre-race pasta dinner on Saturday. This will be an excellent opportunity for you to meet your pacers and ask them with any questions that you might have. Q12. Where can I send feedback to my pacer? This entry was posted in Race Info and tagged pace groups, pace teams, pacers, pacing, why join a pace group. Bookmark the permalink.